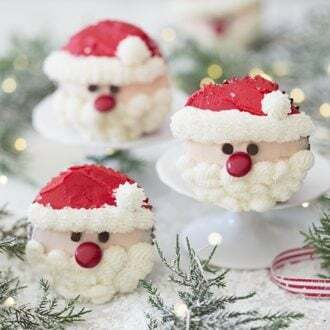 These delicious chocolate cupcakes topped with cute little Santas made with buttercream will bring holiday cheer to the table and delight your guests! 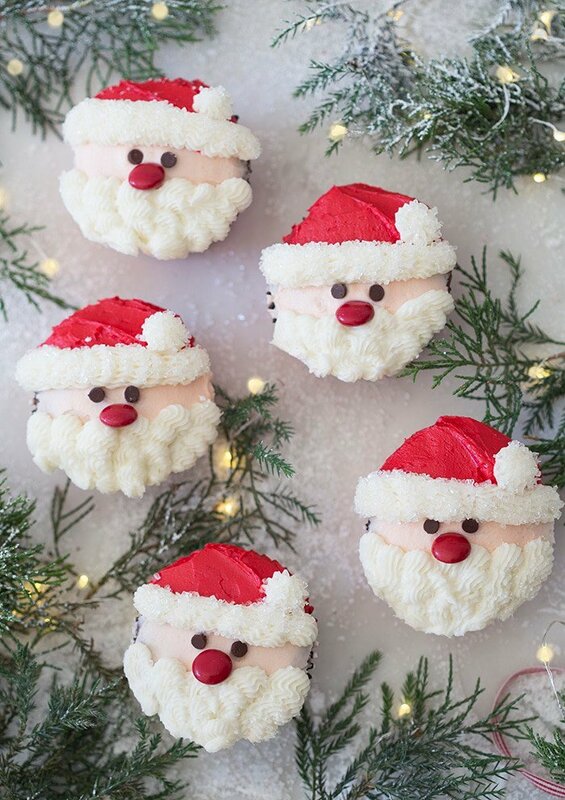 My little Santa cupcakes are decorated with buttercream, two mini chocolate chips for the eyes and a red M&M for the nose. SO simple, easy and best of all, NO FONDANT!! They taste even better than they look! If you prefer your frosting to be less sweet then try whipping up a batch of Swiss or Italian buttercream. Silky smooth and delicious! Don’t have a star tip? Just snip the end off a piping bag and it will work pretty well. If you want to whip ip an AMAZING batch of vanilla cupcakes for this instead try my moist vanilla cupcake recipe! Adding 1/2 teaspoon of peppermint extract to the cupcake batter and or the buttercream will give a festive kiss of mintyness to this dessert! For the cupcakes; preheat the oven to 350 degrees and add papers to a cupcake tin. Start off by sifting the dry ingredients with the sugar into a bowl of a stand mixer and whisk together until combined. Add the wet ingredients into a large bowl and whisk them together. Now add the wet ingredients into the stand mixer with the dry ingredients and whisk until the batter is smooth. Distribute batter evenly into the cupcake papers and bake for about 15-20 minutes or until a toothpick inserted in the center comes out clean. Allow time for these cupcakes to cool before decorating. For the vanilla buttercream; beat the butter until light and fluffy in a standing mixer fitted with a paddle attachment. Sift the confectioners sugar into the creamed butter and add the vanilla, salt, and milk. Divide the buttercream into three batches. One will remain uncolored, one will be red and the other flesh tone (whichever color you prefer for that is fine! 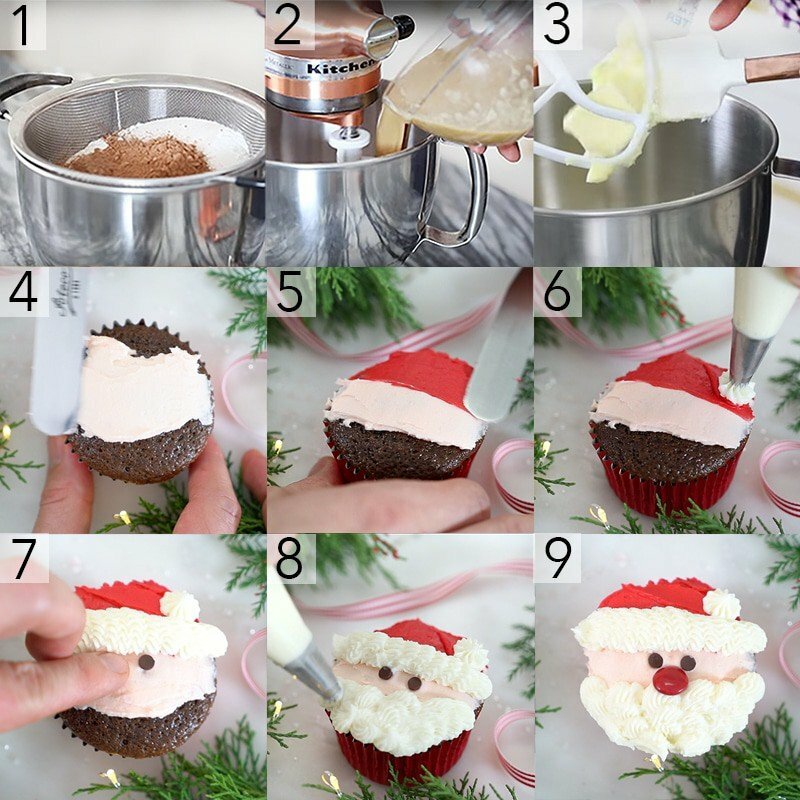 Use a small spatula or knife to smear and smooth some of the flesh toned buttercream across the centre of the cupcake. Smear red buttercream onto the top third of the cupcake. I also spread another layer diagonally from the lower right to the upper left for the fold of Santa’s hat. 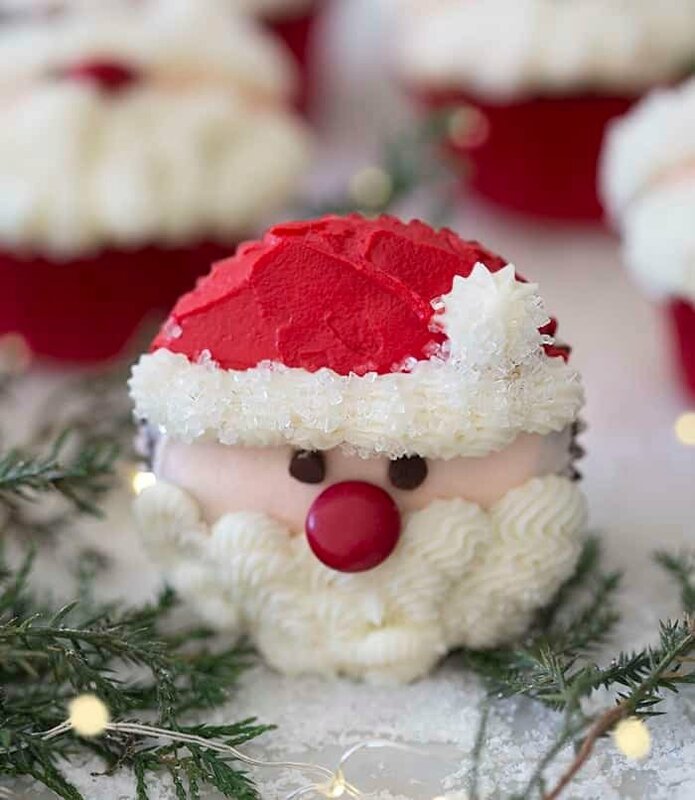 Use a star tip to pipe a dollop of white buttercream for the end of Santa’s hat. Now use the same tip and wiggle it across the cupcake to create the hat’s trim. Add the two mini chocolate chips pointy side down for the eyes. Pipe the beard with the star tip using a loopy motion to give some gentle texture to the facial hair. Use a red M&M (logo side down) for the nose. For a little extra sparkle try dipping the white trim of the hat in sanding sugar as seen above. I used a spoon full of sugar so I could control what parts of the cupcake got sanded. You could also try this step before the beard is piped on. 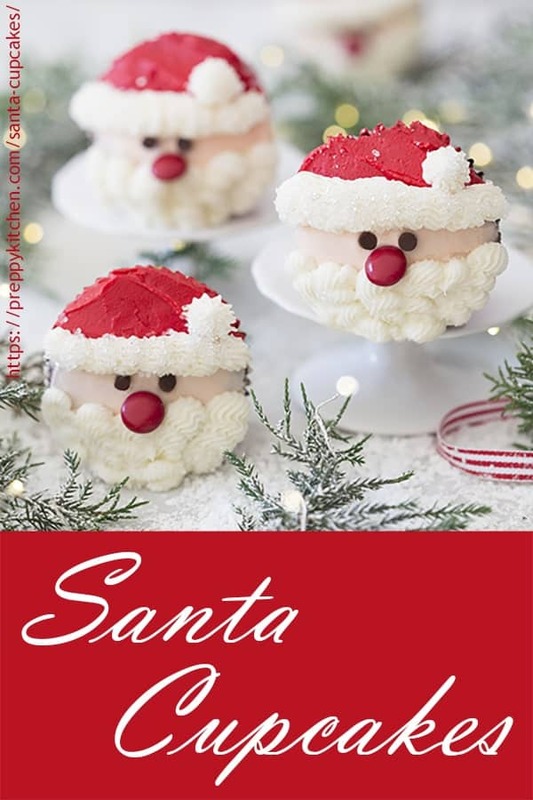 Super-cute easy to make and DELICIOUS chocolate Santa cupcakes all decorated with buttercream! Preheat to 350F. Add papers to a cupcake tin. Sift the dry ingredients (including the sugar) into the bowl of a stand mixer and whisk to combine. 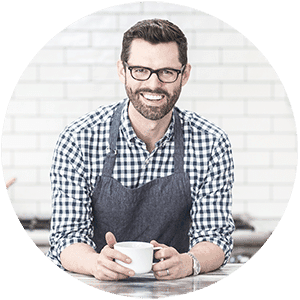 Distribute batter evenly into the cupcake papers and bake for about 15 -20 minutes or until a toothpick inserted in the center comes out clean. In a standing mixer fitted with a paddle attachment, beat the butter until light and fluffy. Sift the confectioners' sugar into the creamed butter. Add 1 tsp vanilla, 1/4 tsp salt, and milk. Separate into 3 bowls. One will remain uncolored. One bright red and the other flesh colored. I used a touch of soft pink and orange but you can choose whichever color you'd like. The white buttercream to a bag fitted with a 199 tip. Any medium-sized star tip will work though. Smear red buttercream onto the top third of the cupcake. I also spread another layer diagonally from the lower right to the upper left for the fold of Santa's hat. 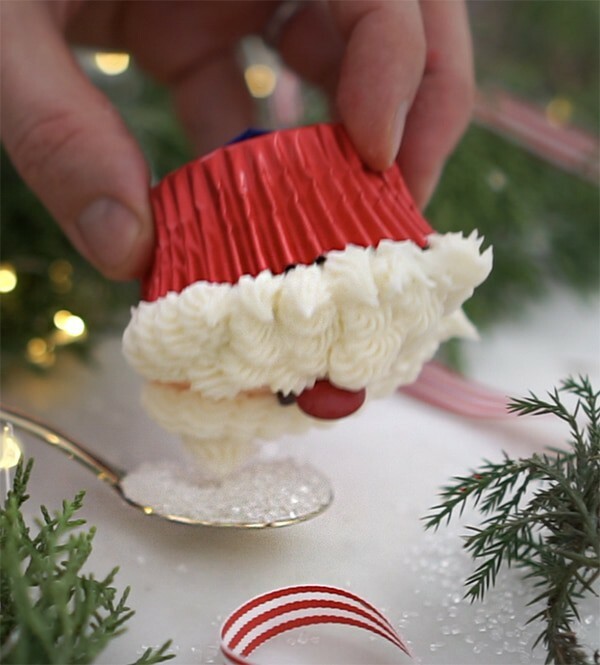 Use a star tip to pipe a dollop of white buttercream for the end of Santa's hat. Now use the same tip and wiggle it across the cupcake to create the hat's trim. I make this cupcakes for my daughters birthday and omg they are delicious, thank you so much for the cupcakes recipe and steps by step on how to make them! I’m so happy they were a hit! Thank you! Made these for a holiday party. They came out so CUUUTE, everyone loved them. But appearances are only one part, the flavor was also wonderful. Lots of “OMG!” reactions when people at them. I ran out of red M&Ms so some of my Santas had green noses, but it only made it cuter. Now – 20 minutes prep time? Maybe for someone other than me! I barely had my ingredients prepped in that time, LOL, but it was so worth it. Thanks! !